Sanvri. It may seem a strange world to you, with many known things being flipped upside down as it would seem. Nevertheless, you live here. Mayhaps you are a human, an elf, a dwarf, a gnome, perhaps a halfling, or one of the dragon-kin. No matter who you are, or where you have come from—you will shape the world. So. Who are you? Are you an elf? The elves are a horse people, and can speak to their horses. The horses live as long as they do—about 300 years. High elves live in cities, raising powerful lines to be the horses of heroes; viri horses. Wood elves live in the wilds as nomads, raising the fleetest, most sturdy horses to walk this earth. However, some high elves speak of splitting: they want to live in mountain halls, as if they were dwarves. They want to breed what they call ‘draft’ horses and smaller, stronger horses. All grown (45 years or older) elves have their own horse, a true friend and partner to them. Chosen from their parents herd, this is how they will start their own line of horses. They tend to live in western wooded Dekita, Tamren, and Hanye. Could your name be on one of these lists here? Or might you be a human? There are three major race of humans: You could be from the Eagle Dominion, the Akaribons, and the Island Folk. Those of you from the Eagle Dominion are mostly a military folk, being knights, peasants, and royalty. There are seven duchies, all with one of their members on the council. The knights ride Griffins--a beautiful and powerful animal, much loved by the citizens. They tend to live for 50 years. They are considered to be adults at 15 years. Might one of these be your name? Your surname, if you are a noble or knight will be your duchy. The duchies are as follows: The Unicorn Duchy, Pegasus Duchy, Dragon Duchy, Wyvern Duchy, Archangel Duchy, Falcon Duchy, and the Hydra Duchy. If a peasant, the job that you undertake, such as Baker, Millwright, Carter, etc. They tend to live in Central Dekita, but are considering pioneering prospects. The Akaribons are maintaining an isolationist policy in Zashai, where they live—no one comes in, and if you go out, you probably aren't coming back in. They do a small amount of trading with a few Halfling families who they trust, but this is the extent of diplomatic relations. The shoguns hold most of the power, and obey only the emperor. They tend to live for about 75 years. They are considered adults at 20. And you Island Folk consist of two subraces: The Ehiku Manawa, and the Ka Moku Moku. The Ehiku Manawa live largely on one island, sailing to another island only seven times, and participating in seven important ceremonies of life: birth, growing up, adulthood, marriage, childbirth, old age, and death. For each of these, they move to a new island, and take part in a new ceremony. The Ka Moku Moku are always on the move, with most of their livelihood in their canoes. They will often go to specific 'family' islands for certain seasons, mayhaps visiting new 'swimming' islands. They tend to live for 40 years, and are considered adults once all their adult teeth have come in. Masculine: Akamu, Anaru, Ekewaka, Ikaika, Hohepa, Kai, Kauri, Kaleo, Kapono, Kaulana, Kealoha, Kekoa, Koa, Lehua, Makana, Mikaere, Nikau, Pika, Piripi, Rangi, Tama, Tange, Tipene, and Wiremu. Or might you be of the Dragon-kin? There are very few of the Strakh (black colored) and the Uur Khilen (red) Dragon-kin left; they are a dying race. However, the Tuhota (blue), Rasan (brass), and Kurushimi (bronze) are still thriving. However, they like to keep to themselves, and are best known for their building and metal-working abilities. They usually live to be about 70-80years of age, and are considered adults at 20. They live in northern Kemesaal. You could be a Halfling. They live on airships, only coming down to trade. They are short of stature, but brave, bold and hardy. One can't help but admire them. Richer families have begun to pioneer methods of growing crops on their airships. An interesting idea, who knows if it will work. They usually live to be 200 years old, and live a full, rich life. They are considered adults at 50. You could be a dwarf. You know, strong in magical runic abilities, with axes and magic practically spilling out of you ears. Not to mention braids. Living in the mountain halls, each in their own clan. They keep to themselves, and generally look down on all other races because they feel that they are the only ones who should be able to have and use magic. It doesn’t earn them a lot of friends. They usually live to be around 150 years, and are considered adults at 30. They mostly live in Wekran and Jerja. Female: Ågot, Alfhild, Anja, Beate, Berit, Bryhild, Cathrine, Christel, Dagny, Dagrun, Dorothea, Ea, Ebba, Erika, Frida, Gerd, Greta, Gry, Hanne, Heidi, Hilda, Inga, Ingrid, Ingvild, Jannike, Judit, Kari, Katja, Kjersti, Laila, Linn, Lucia, Maja, Malin, Marita, Oda, Ragna, Rakel, Runa, Sigrid, Sonja, Sylvi, Thora, Tordis, Tyra, Ursula, Vera, and Ylva. Male: Albin, Alvar, Brynjar, Caj, Dag, Dieter, Egil, Einar, Eirik, Frode, Gunvald, Gunther, Halvard, Hjalmar, Humbert, Ingvar, Isak, Jakob, Jarl, Kjetil, Reidar, Runar, Steinar, and Vidar. Their surnames come from which clan they belong to. And, at marriage, when a woman leaves her clan to join her husband’s clan, she takes on his clan name officially, but many of her friends will refer to her old clan name. Abschuworung, healing magic, Besvarjelse, evocation magic, Verzauberung, enchantment magic, Framkallade, summoning magic, Vostellung, illusions magic, and Verwandlung, transmutation magic. Frequently used Gnomish names are as follows. Note: They do not carry surnames. And, the double l is hard to pronounce, but you stick your tongue down at your bottom teeth and make an ‘l’ sound. It’s rather interesting. But enough of this. Male: Afon, Bleddyn, Bran, Brynmor, Celyn, Culhwch, Dai, Gawain, Glaw, Glyn, Glyndwyr, Haul, Hefin, Islwyn, Llewlyn, Mihangel, Mostyn, Pryderi, Rhydderch, Talfryn, & Yale. You people of this "inkwell" could call this a 'solo write' crossed with a 'simulator'. I will tell you what happens to your people. At times, you will be required to answer a question in order for me to tell more. Otherwise, that person will be stuck in a time loop. And that’s not fair to them. I will need the following information to be able to find this person you speak of to track them. Please give me as much information as possible. Some of your answers may end up needing to be adjusted in order to find the person, if you have been accidentally misinformed of a piece of culture, etc, etc. What relatives of theirs are alive, and which are they in contact with? What is the one thing they want most? What do they think about magic? Additional information would be appreciated, but I do not think necessary. Once this message appears, I will give you the map of the world, so that you might have a better idea of where everything is located. Please, excuse me for giving almost too much detail. I will begin telling you of the history as soon as the first person fully appears. Additional people will be added until I say that’s enough. The tale, too, ends when it ends. Here is the map, as promised. Can I reserve a spot? This is awesome! Greetings, Agent Winter. Yes, you may. Welcome to Sanvri. Who were their parents? Her mother was a common enough wood elf. She isn't supposed to know who her father is, but he's a human. What did their parents do for a living? Her mother bred horses, like all other elves. She believes her father was a blacksmith. What relatives of theirs are alive, and which are they in contact with? Her mother is still alive and in contact with her - they live nearby. She is not in contact with her father or any siblings or cousins. She does also know her maternal grandparents. What does this person do for a living? I'm assuming she breeds horses like other elves? Do they enjoy their work? Yes! What does this person look like? She is slim and tan. Her hair is long and brown, but her eyes are oddly pale. She is very soft and curvy. Are they married? No, not yet. I'll complete this later cause my mom is yelling at me. Greetings, Kitten. 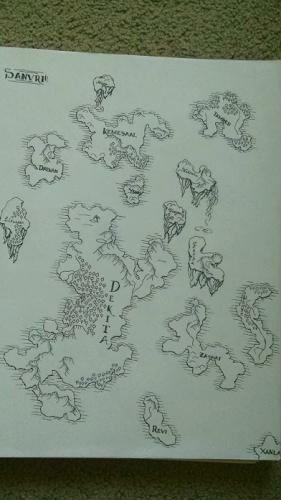 Many elves live in Dekita, Tamren, and Hanye. Now that the map is up, perhaps you can discover where Pyferni lives? Perhaps as a Wood Elf, she might be located in Central Dekita. Many of the Wood Elves live in the forest there. This is, however, merely a suggestion, and you have the best means of finding Pyferni. I recognize her, but cannot locate her until you give me a location. What race of human was her father? I'm not sure if I'll have time to fill this out, but it's too cool not to reserve, so I'm gonna reserve. Just keep in mind that I might have to drop out. Greetings, Leeli. This should require minimal participation, so if needed, I can offer the person you find fewer choices, if that would be better to accommodate you and the person you are seeking out. Wow this is an awesome world! It makes all the work I've done on my Jith seem like nothing (though I think Jith might be bigger, and I do have a tendency to concentrate on only one country; my favorite one!). Any tips? One thing I concentrate in my world-building is the culture: what is each countries motives, desires, clichés, traditions? I also have many made-up animals which aren't even based off of real life ones, such as groshen, raimeten, sarpisons, crainavalerians, faiwerths, fwuggudy-duggudies (yes you're not reading that wrong). She's a deep, indulgent, jubilant blue-green, with silver scales in two rows along her supple torso and large, mournful black eyes. She has no horns or crest, and strong wings. Her tail is short. What do they think of magic? Well, there are better and safer ways of getting things done, but it's all right, if used sparingly. It depends, really. Greetings, Jithkeeper! So we are both worldbuilders. Look to the world around you for inspiration. I too, mainly focus on the cultures, and unfortunately, little else. I usually only have vague ideas as to how the geography would look and feel like. My cultures have too much information at times. I had to condense and prune a lot. For example, I forgot to describe the Dragon-kin, fool that I am. I would suggest beginning by building cultures which are similar to 'real-life' ones. Combine them, figure out what make social lives work. I would recommend working on one culture at a time, fleshing it all the way out, then try putting a character who comes from there in a story, and see if it is believable. I have also done language building. And map making, as you can see. I also focus on making my 'made up' creatures believable. Just think: why would this be? And because of this, what might happen? For example, my star people (who do not live in Sanvri) were once humans who came into contact with magic. Over a long time of using magic, their appearance began to change, do to so much use. I hope I have been of some use, and did not just spill words uselessly over the page. Perhaps we may speak more of this subjecy at another time. To all: I forgot to mention that the dragon-kin look are a humanoid race. They are tall, and often muscular, covered in scale plating with dragon's heads. Other than that, Jithkeeper, I think I know who Nyarai is. If you would like to revise her appearance, I believe that she would be able to be found. Awesome! How about Nyari is just how I descrbed her but with a human body, and no scales or wings? Still supple and slim, still blue. *nods* Thank you. I have been able to locate her. Give me a moment, and her story will begin to unfold. Oh and also YES we must CERTAINLY discuss worldbuilding some other time! It needs more celebration on this CB; most people seem to just come up with things one the spot, without careful work. Their should be a thread JUST for discussing worlds.